One of the great joys of owning a dog is watching them play with their toys. For some dogs though, playing with toys is an exercise in mass destruction. The good news is there's a great selection of toys that will make you and your dog happy no matter how much he chews. The Busy Buddy line by PetSafe has several durable options. The Bouncy Bone is made of heavy, hard plastic and the bone ends unscrew so you can place rings of dental treats inside. The rings encourage your dog to chew and provide him with a delicious treat too. Customer reviews on the Bouncy Bone website give a combined 4 out of 5-star rating and one customer notes it is "excellent for picky, power chewers." The Bouncy Bone comes in small, medium, medium/large and large and the treat rings are sold by size as well. The small starts around $5 and the large around $18. 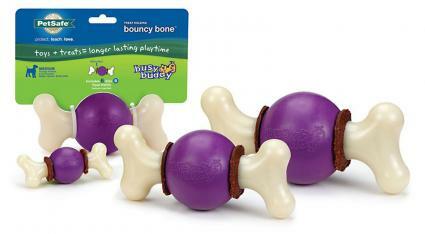 The Bouncy Bone comes with a set of treat rings, and you can buy refills for $6 and up. When it comes to heavy duty toys, you can't go wrong with KONG. The KONG Extreme is made specifically for aggressive chewers, and these toys can take a beating without breaking up into pieces. They are made from durable black rubber and come in several sizes. KONG toys are recommended by veterinarians, dog trainers and dog behavior specialists and used by shelters because of their durability. vetSTREET praises the toy for its durability and affordability calling it the "hardest working dog toy under $10." Another great thing about KONG toys is you can stuff them with food and freeze them, which gives your dog a treat that will occupy him for quite a while. The same material in the KONG Extreme is in other toys by KONG such as a Frisbee, bone, tire and a ball. 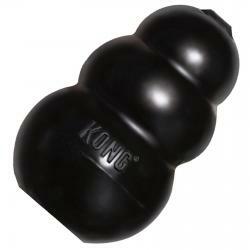 KONG toys come in S, M, L, XL and XXL sizes. They cost around $7 for the small and about $18 for the extra-extra large. The manufacturer claims Goughnut toys are "nearly indestructible" and based on designs by professional mechanical and polymer engineers. Goughnuts have a unique safety feature: the inside of the toy is red. If your dog is able to destroy enough of the toy that you see the red, this is a sign to remove the toy from them, so they don't end up swallowing any parts by accident. 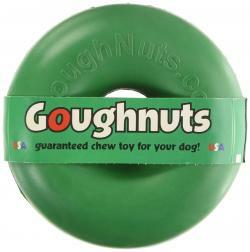 If your dog chews through the Goughnut, the company will replace the toy for free. Certified Dog Behavior Consultant Don Hanson, ACCBC, BFRAP, CDBC, CPDT-KA, who operates Green Acres Kennel in Bangor, Maine, gives praise to the Goughnut saying, "We sell Goughnuts in the store and use them in our day care. They are, as the maker claims, nearly indestructible." The toys come shaped like either a ring or a stick, in several colors, with the black Goughnuts designed for the toughest chewers. The Indestructible MAXX black stick is an excellent choice. It retails for around $28. Veterinary Clinic Leo's Pet Care in Indiana recommends the Nylabone line. Nylabone makes several chew toys for heavy chewers. Some are shaped like bones like their BIG Chew. They have other toys from their Dura Chew line shaped like antlers, bison horns and knuckle bones. Nylabone chews are made from extra strong nylon; they are also splinter free and flavored. These features give your dog a safer option for chewing. An added benefit is these toys will last much longer than buying an antler or knuckle bone. Of course, just because they are safer, you still need to keep a close eye on your dog and take the toy away if you notice it starting to fray from wear and tear. The Nylabone BIG Chew Chicken Monster Bone Dog Chew retails for about $16. The Nylabone Dura Chew Nylon Antler Dog Chew comes in medium and large, with the medium retailing for around $5 and the large for around $10. The Hurley Bone is latex free and made from recyclable materials. The bone shape makes it a good option for throwing and fetching, or just hanging out and chewing if that's what your dog prefers. It also floats, so it's a safe alternative to throwing sticks if you take your dog out to a water source for some splashing around. 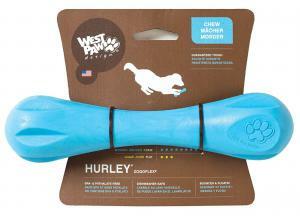 Customers from popular dog supply retailer Chewy.com, give the Hurley bone a positive rating, with comments such as "great toy for powerful chewers" and "strongest rubber bone yet!" Another option from Zogoflex is the Jive Ball. 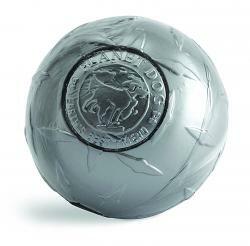 Dogs love balls and this is a great option for a determined chewer. The odd shape to the ball also causes it to bounce in different directions for more enjoyable play, and like the Hurley, it floats, so it's a terrific option for outdoor fetching sessions. In 2013 the Jive Ball was a "top vote-getter" in the Dog Products- Non Edibles category of Pet Product News International's 2nd Annual Retailers' Top Pick Award. You can find the Hurley Bone or Jive Ball from the manufacturer website (linked above). They come in XS, M or L and both retail for less than $15. Another terrific ball option is the Orbee Diamond Plate Ball from Planet Dog which can withstand the most aggressive chewer. The ball also floats and is very bouncy for hours of fun. The ball comes in three or four-inch diameter sizes in orange, steel or violet. On Planet Dog's own durability scale, the Orbee Diamond Plate Ball gets at 5 out of 5. The ball gets a 5-star rating on Chewy.com, with reviewers noting it is, "the only ball that lasts more than a day." You can pick up the Orbee Diamond Plate Ball at Planet Dog or Chewy.com (linked above) and it retails for approximately $13. It's important to find toys that will occupy your dog's attention long term. Finding the right toy will be cheaper in the long run as you won't have to replace a chewed up toy all the time. However, it's also much safer for your dog to chew toys that will not break apart or fray as dogs can ingest a piece of the toy which can lead to an emergency vet visit. As you'll see from reading reviews of dog toys, it's hard to find one toy that has all-positive reviews. One toy may seem almost indestructible to one set of dogs and their owners, yet fall apart for others. This is why dog behavior expert Hanson tells clients to try a new chew toy under close supervision. This way, you can intervene if the toy becomes a danger. He notes that he has known dogs that have destroyed an "indestructible" toy in less than five minutes. Best Friends Animal Society agrees and reminds dog owners to check toys regularly for wear and tear that might lead to parts breaking off into the dog's mouth.